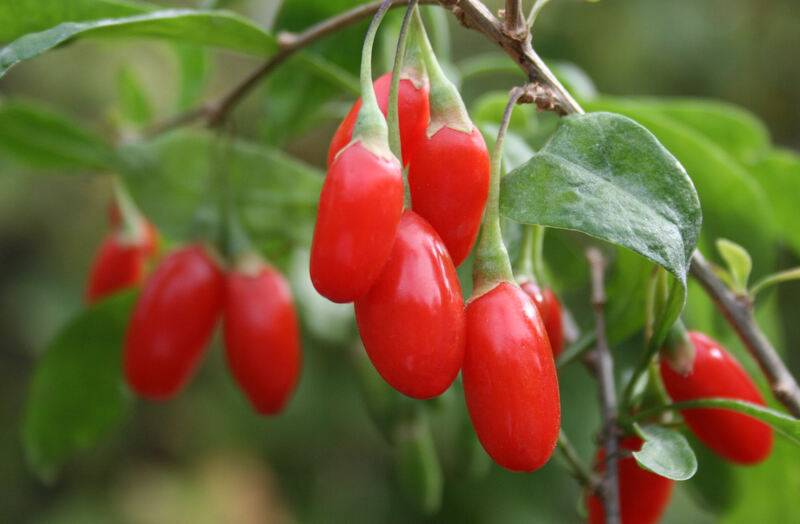 Goji berries have been used for 6,000 years in Chinese herbalism to protect the liver, help eyesight, boost immune function, improve circulation, and promote longevity. 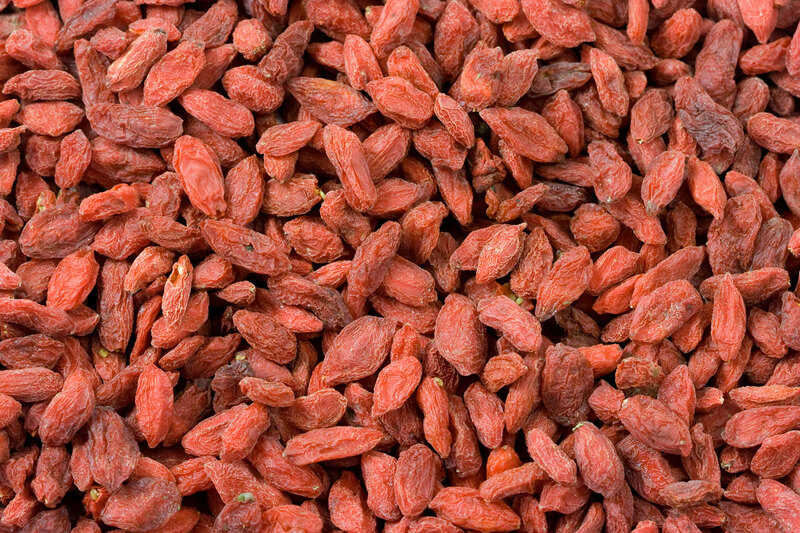 Goji berries, also known as Lycium barbarum, wolfberry, gou qi zi, and Fructus lycii are usually found dried. They are shriveled orange-red berries that look like red raisins. Goji berries have been eaten in Asia for ages to promote longevity and currently are used to help treat diabetes, women’s health, high blood pressure, and age-related eye problems. Goji berries can be eaten raw or cooked and are becoming more prevalent in juices, herbal teas, and medicines. Since they have short shelf life it is a good idea to store them in a cool place or even in the refrigerator. 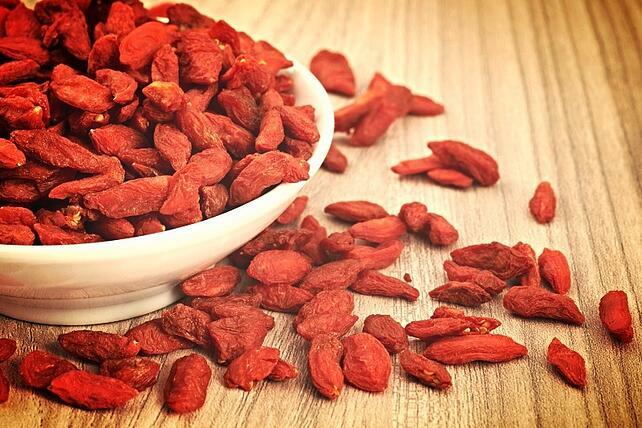 Goji berries are rich in vitamins and antioxidants, particularly carotenoids such as beta-carotene and zeaxanthin. One of zeaxanthin's key roles is to protect the retina of the eye by absorbing blue light and acting as an antioxidant. In fact, increased intake of foods containing zeathanthin may decrease the risk of developing age-related macular degeneration (ARMD). Some studies using goji berry juice found benefits in mental well-being and calmness, athletic performance, happiness, quality of sleep, and feelings of good health. Significant animal research has demonstrated anticancer, antidiabetes, antihypertensive, anti-infertility, anti-myelosuppressive, antioxidant, hypolipidemic, immune-stimulating, and radiosensitizing properties. Goji berries are a member of the nighshade family, so if you are sensitive to nightshades, it may be a good idea to avoid or limit your intake of goji berries. Cook in a covered pot four to six hours on warm, or use the lowest flame possible; a crockpot works well for congees and can run on low overnight. It is better to use too much water than too little, and it is said that the longer congee cooks, the more “powerful” it becomes. Put them in your cold cereal or oatmeal like raisins. Make a cold or hot tea infusion. Combine them with your favorite nuts and dried fruit in a trail mix.